Museum Lucrattoday is a hospital complex housing some exclusive series of tapestries by the famous French artist Jean Lurçat. Jean Lurçat born 1st July 1892 played a pivotal role in the revival of contemporary tapestry. The very first tapestries made by him date back to as early as 1917. Formerly an orphanage, it was renovated later as an extension to the already existing Jean Lucrat Museum. The two separate buildings house the modern tapestries of Jean Lurçat and medieval tapestries respectively. Jean Lurçat’s depicts a more scientific and modern take on the evolution of species and the end of the world, like a nuclear war wiping out the entire human race. It is fascinating to take a walk through his imagination! Love this? Explore the entire list of places to visit in Angers before you plan your trip. Fancy a good night's sleep after a tiring day? Check out where to stay in Angers and book an accommodation of your choice. How popular is Musee Lurcat? People normally club together Cathedrale St-maurice and Rue St. Laud while planning their visit to Musee Lurcat. The apocalypse looks like fun. I have visited this museum more than 10 times. 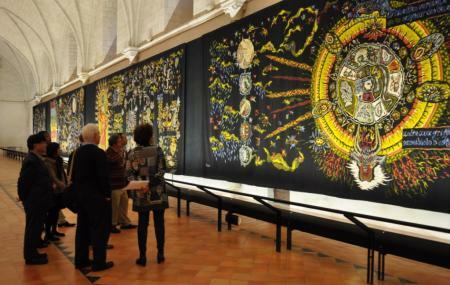 I try to see these tapestries on the same day that I see the Apocalypse Tapestries in the Chateau d'Angers. I always ask what the photography policy is. I was pleasantly surprised to be told that there are no restrictions other than on the use of flash. Amazing tapestries. You need to visit the other apocalypse museum in the castle to understand everything. There are amazing modern tapestries in the museum. The staff was friendly. Very worth visiting.